Richard Thompson tackles two rock cliches in one fell swoop with his current album and tour. When it came time to record Dream Attic for his new label Shout Factory, Thompson said (like so many touring musicians before him), "Hey, we sound great on the road and whenever we tour a new album the music sounds better by the end of the tour than it did when we recorded it. So why not record the next album live? Work out the songs...on the road!" So, like Jackson Browne and Joe Jackson and too many to mention, that's what he did. 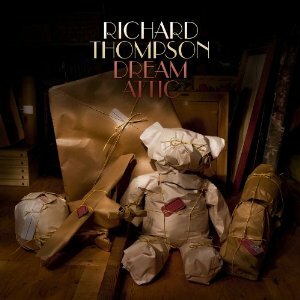 The result is Dream Attic, which is neither a landmark work of his nor a flop but simply a new album by Thompson, stronger this time melodically than lyrically. I wasn't gutted that my guest and I were late getting to Town Hall (thanks, NYC subway system!) and came in during the second song because the first -- "The Money Shuffle" -- is far and away the weakest on the album, with tepid digs at the financial industry. Not surprisingly, the album's songs sounded better live despite being road-tested by the band because the album's strength is its melody and they could stretch out further in concert. In case you didn't know, Thompson is easily -- yes, easily -- the greatest guitarist in history on both the acoustic and electric guitar. He's certainly right up there in either category alone. Toss in the fact that he's a world-class songwriter and you've got a sense of his skill. Tonight, it happened first on "Sidney Wells," a song in 9/8 time Thompson helpfully told us. A piercing, driving number, the music built and built and built with Thompson tearing into a guitar solo that virtually lifted the crowd off its feet. (I say virtually because we actually stayed seated so we wouldn't miss a note before leaping and roaring our pleasure.) Thompson was deep into it when he slowly worked his way back out again, finally looking up at his bandmates with a look of pleasure and setting them all off on another fierce passage. The world is filled with virtuosos, guys who can play the guitar in a fast and flashy manner. What is it about Thompson's playing that elevates it so? First, of course, the solos are musically consistent -- they follow an internal logic (often a mathematical one that we instinctively respond to even if we couldn't parse it). But Thompson's solos are never just about runs or showing off. They're also emotional journeys. "Sidney Wells" is about a cold-hearted serial killer who boasts about what he's done when the cops finally come calling. Thompson's solo is a cry from the heart, both a reflection of the violence, the tortured mind of Wells and the women he slaughtered. I'm bringing all that to the music, of course, but the truth is that his solos aren't just impressive: they're moving. Then show stepped into high gear when Thompson dug into his catalog of songs. "Time Will Show The Wiser" kicked things off, a gem from the first Fairport Convention album. (They're the British equivalent to the Band, but folkier.) Then he blew us away again with "You Can't Win," a more recent tune that's a bit of a workout -- a song the band can stretch out on. Thompson did that again with another coruscating solo that equaled the brilliance of "Sidney Wells." Another showstopper was "Al Bowley's In Heaven." Once mostly an acoustic number, it was the tune that stopped 'em dead every night, the way "1952 Vincent Black Lightning" does now (Thompson is resting that classic for the moment). Now it's performed beautifully and then gives everyone a moment in the spotlight. This touring band also plays on the album and simply because of where I was seated, I was focusing on drummer Michael Jerome a lot. He's a striking figure behind the drum kit, towering over them (quite a tall fellow) but playing with subtlety and skill and noticeable pleasure. The drum solo is one of the more dreaded conventions in rock but he made it a delight. "Wall of Death" -- from the masterpiece Shoot Out The Lights -- was given a full-bodied treatment and then they wrapped it up with the romp "Tear Stained Letter." For the encore, Richard returned to the stage with his son Teddy, who has grown stronger and stronger with each one of his solo albums. They sang a duet on the Tim Finn of Crowded House gem "Persuasion." That's the very first number many people heard from Teddy, when he joined his dad onstage years ago. It's fascinating to see how much he's grown vocally. A song that can be gentle this time had an underlying fierceness to it that was quite moving, not to mention the pleasure they took in performing together. Here's video from a much earlier performance, still quite lovely. Two more numbers and that was it. When you see an artist repeatedly, you're not seeing them in concert so much as checking in. What songs are on their mind right now? Oh, "Man In Need," that's a terrific one. "One Door Opens?" Oh and "Tear Stained Letter" still gets 'em moving. Thompson is such a wry, friendly presence that his every utterance draws a chuckle from the faithful (most of the time a deserved one, though sometimes he'll say "thanks" and they'll still be in stitches). His core audience returns again and again. You don't spend the show waiting for some epic solo -- every song has passages of show-stopping brilliance from someone in the band. But you know that at some point, he'll stop your heart. Maybe it's a lyric that cuts home, maybe it's a strangled vocal or maybe it's hearing an old favorite for the first time in years. But invariably it's also a musical solo that tears you down and builds you up at the same time. You expect it. Heck, you demand it. But it still surprises and moves you every time.